Made famous by Eat, Pray Love, Ubud is pinned as the cultural capital and is one of the most popular parts of Bali to visit – and it’s not hard to see why. Also known for its spiritual retreats, ample rice fields and the Sacred Monkey Forest, Ubud boasts plenty to do for everyone. Now, early mornings might be off your radar when on holiday but it seems an early rise is the best way to see the best parts of Ubud. 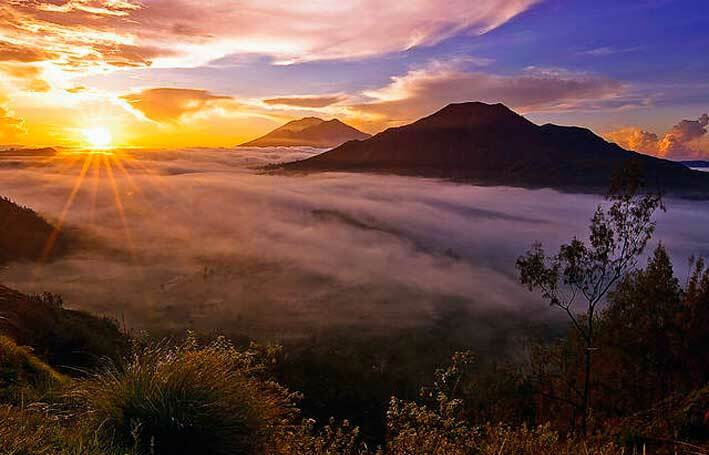 For the adventurous kind, take a an unforgettable sunrise trip up the active Mount Batur (Bali’s tallest volcano) for stunning views above the clouds and a well-deserved banana sandwich and hot drink at the top – a warm jacket is a must! Next up, rise before dawn to board a traditional boat and catch the wonderfully calm waters of Lovina alive and bursting with dolphins of many different species. A trip well worth getting up for. As a reward for the early starts, treat yourself to a massage at Karsa Spa, soak up in the magical healing waters at Banjar Hot Springs or relax your mind, body and soul with some yoga at the famous Yoga Barn. If Ubud sounds like the place for you, take a peak at Villa Hartland which is in a beautiful setting just 7 miles outside of the centre. Heading south, we have Kuta. Where sunsets never get old on the miles of beautifully kept beaches, Kuta is a popular destination for surfers and sunbathers alike. The life in Kuta doesn’t stop when the sun goes down. 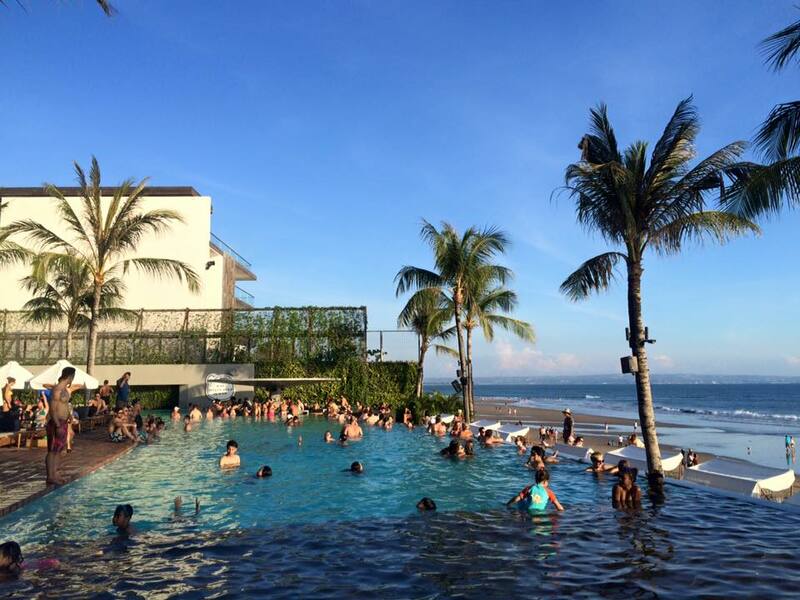 By night the Kuta party scene comes alive with stretches of bars and clubs particularly for those party-goers. If this is for you, make sure you head to the Sky Garden Rooftop Lounge which has 8 pubs and clubs under one roof, offering cocktails with views of the Legian skyline and all you can eat buffets. Other activities include visiting one of the oldest temples in the area, Vihara Dharmayana Kuta. A great opportunity to learn about the rich history dating back to 1876; take a day trip with the family to one of the water parks, Waterbom or Circus Water Park to experience thrilling slides or relax on the lazy river; explore the high street fashions of Bali and head to the Beachwalk shopping complex; or learn something new and test your balance with surf, paddle board or windsurfing lessons – the question is, have you got good enough balance for paddle board yoga? 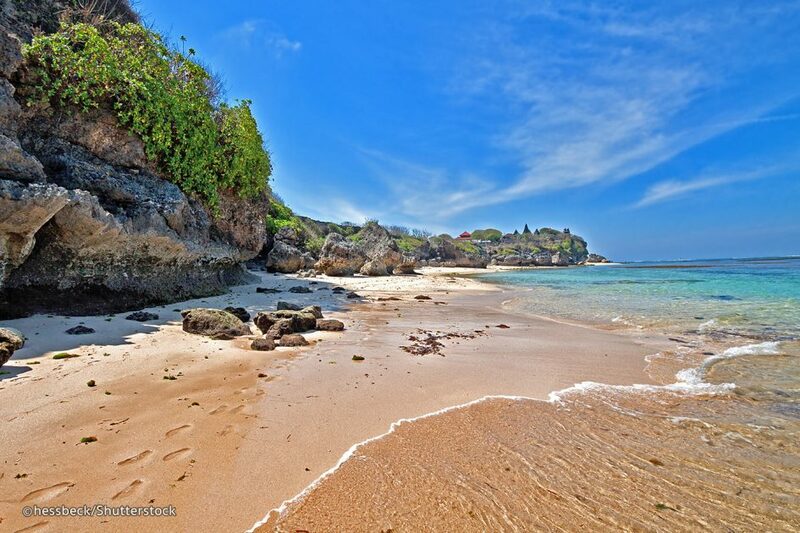 Just to the south of Kuta in Nusa Dua, are some of the best spots in Bali for snorkelling to get close to the spectacular underwater life. Amed and the Gili Islands are also great for the snorkelling scene, or even Scuba Diving via top quality PADI courses. Heading away from the crowds down on the south-west coast of Bali is Uluwatu, a mecca for surfers from all over the world. Along the rugged coastline toward the peninsular is one of the most iconic temples, Uluwatu Temple (where ‘Ulu’ means top and ‘watu’ means ‘stone’. It’s the perfect setting for a spectacular sunset, but watch out for those shamelessly cheeky possession-stealing monkey friends (they will usually return your belongings if bribed by bananas or peanuts!). 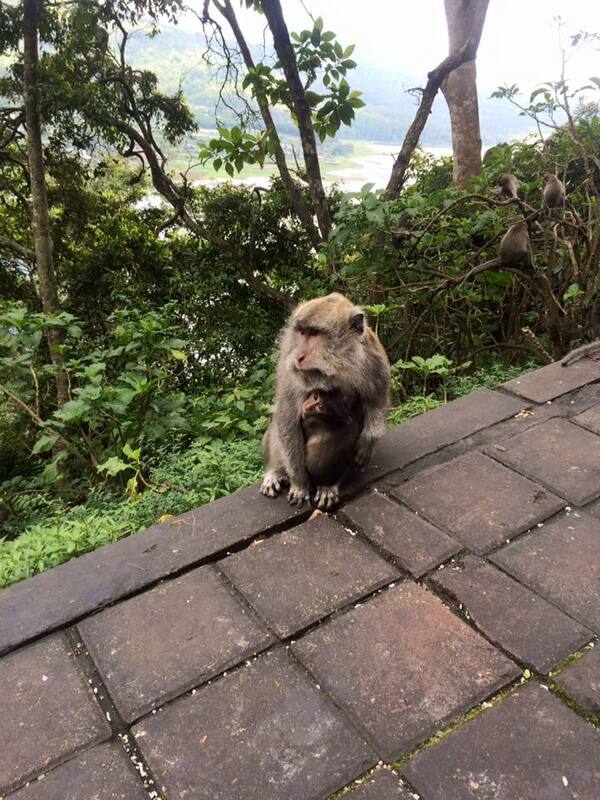 The monkeys are actually there to symbolize guards of the temple to deter bad influences. If you fancy a stay in Uluwatu, check out Villa Khayangan which has beautiful panoramic views of the Indian Ocean or the Villa Jamadara in the higher regions of Uluwatu. Seminyak is one of Bali’s many hot spots for beach-goers and wave-catchers with some of the best beaches on the island. The golden white sands of Double Six Beach offers quality dining, beautiful sunsets and the opportunity to saddle up and ride through the shallow waters of the ocean. A colourful array of parasols and bean bags at La Plancha hosts a great place to sip a cold Bintang and watch the world go by. Beach bars aren’t hard to find within this area; The Potato Head Beach Club has gained popularity from those who want to enjoy drinks, dining and/or partying to live music sets with an ocean view – great for after a day on Seminyak Beach (the top attraction in Seminyak). For a more relaxed beach club you could give Komune Beach Club a try, with a chill-out music and an open air lawn cinema. Other top beaches within Seminyak are Echo Beach for more surfing or Petitenget Beach for some culture and romantic sunsets. A step away from the hustle and bustle is Villa Samuan in quiet and paradise-like surroundings within easy reach of the beaches. 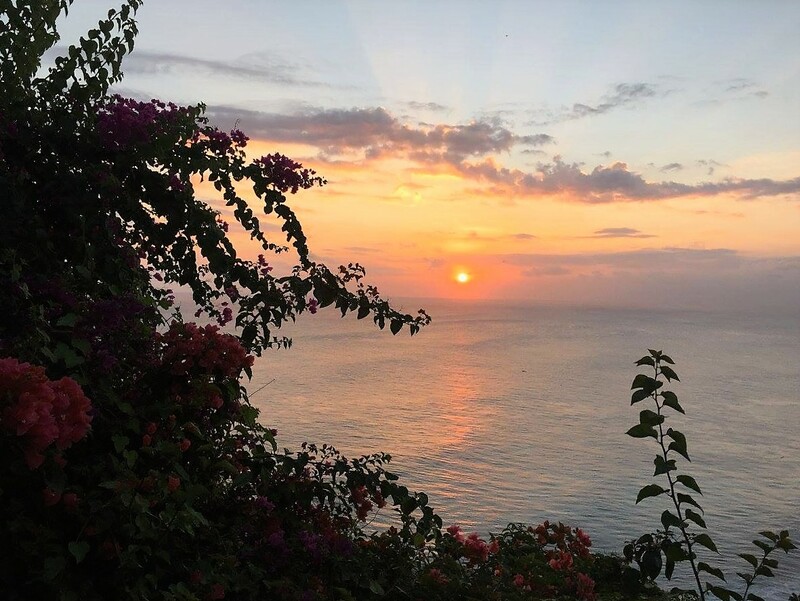 Bali boasts the perfect combinations of culture, adventure and relaxation for everyone to enjoy; one thing is for sure, you can’t leave without witnessing a beautiful Bali sunset. 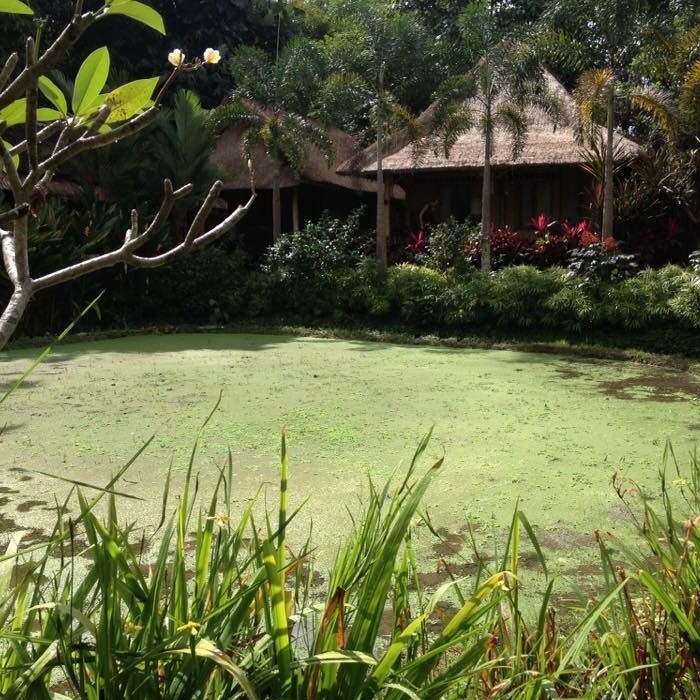 To complete a perfect luxury get away check out our portfolio of luxury villas in Bali. If you feel you would still struggle to decide where to go and stay, then feel free to give us a call on +44 1202 203656 or send us an email so we can help you tick off your top things to do.